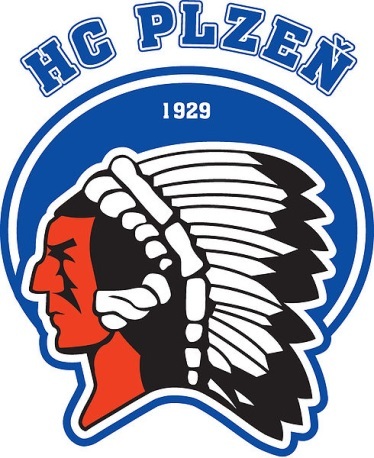 I was even more surprised to discover that the players of HC Skoda Pilsen (Plzen, in Czech), the reigning champion of the Czech Extraliga (the country’s highest Hockey League), wear an Indian head patch on their uniforms and are nicknamed the Pilsen Indians. In addition to the logo, the Pilsen club also has a live mascot (presumably a Czech) who dresses liked a Plains Indian. Moreover, at the beginning of each season, an individual in the garb of an Indian shaman comes on to the ice in the club’s home arena and performs a good luck ritual on behalf of the team. The mascot and shaman can be seen here. HC Skoda Pilsen is currently owned by former National Hockey League star (and Czech native) Martin Straka, who at age 40 also doubles as the team’s captain and star player. In Game 7 of last year’s Czech counterpart to the Stanley Cup playoffs, Pilsen defeated HC Kiln on a series-winning goal by Straka, allowing the club to claim its first ever Extraliga championship. The team’s official video illustrates the seriousness with which the club takes its association with Native American imagery and the inspiration that it derives from what the team refers to as the” heroism” of the “Last Mohican” (a reference to the famous James Fennimore Cooper novel). 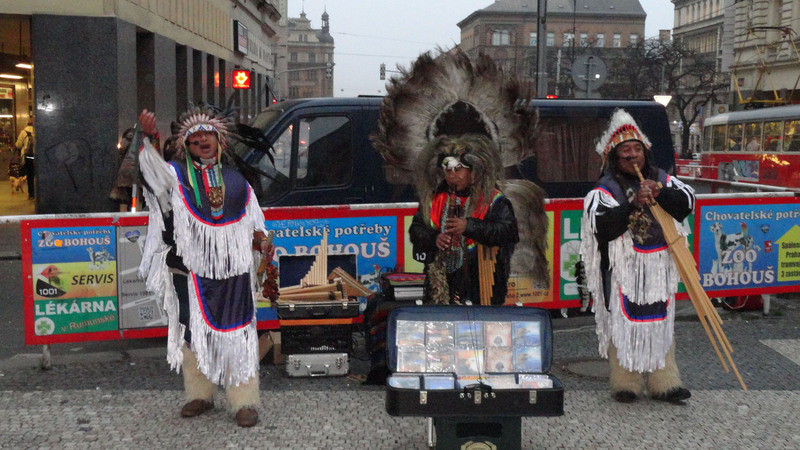 The Czech fascination with Native Americans dates back to the late 19th century when the Czech Republic was part of the Austro-Hungarian Empire. Much of this fascination can be traced to the novels of German adventure writer Carl May (1842-1912). Several of May’s novels were set in the American West, and these works were extremely popular throughout the entire German-speaking world. Inspired by James Fennimore Cooper and American painter George Catlin, May’s novels treat Native Americans much more sympathetically than the typical Hollywood or television western of the first half of the twentieth century. May’s Indians were typically portrayed as noble savages who valiantly resisted the greed and rapaciousness of English-speaking settlers. The white protagonists in his novels were usually Americans of German descent who typically felt a kind of spiritual kinship to the Native Americans, a la Cooper’s Natty Bumpoo. May was widely imitated by other German and Czech writers, and many of his novels were later made into films, which also incorporated the positive depiction of Native Americans. This tradition continued after the beginning of the Communist era, with the East German film industry in particular turning out dozen of “Osterns” (literally, “easterns”) which were set in the American west of the 19th century and depict Native Americans as the innocent victims of white racist capitalism. These films were widely distributed behind the “Iron Curtain” and appear to have been especially popular in Czechoslovakia. A shortage of Native American actors in Eastern Europe led to the casting of swarthy Yugoslavs as the Indians, with one particularly popular actor, Gojko Mitic, eventually being made an honorary Sioux Indian after his films were shown to Native American audiences in the 1980’s and 1990’s. 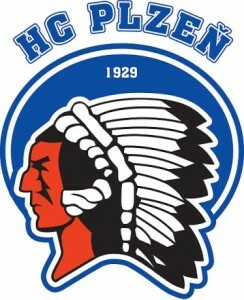 The formal linkage of the Native American image with Pilsen ice hockey team in the Czech Republic is of recent vintage and dates only from 2010, but the city’s association with Native Americans dates back to the early 20th century. Indian head symbols have been associated with goods produced in Pilsen since at least 1915. Their usage has been especially prominent in regard to the brewing of beer (the term pilsner is derived from Pilsen) and the production of Skoda automobiles. The current Skoda logo can be easily recognized as an adaptation of the profile of an Indian chief. In fact, in 2010, the year that HC Skoda Pilsen adopted the Indian symbol and team name, the American Center of the United States Embassy in Prague featured an exhibit entitled, “The Story of the American Indian in Pilsen.” That exhibit focused upon the fascination with Native Americans on the part of the city’s residents and on the history of the attachment of the American Indian image with products produced in the city. Moreover, Pilsen’s more recent history makes it especially inclined toward American symbols. According to Czech hockey fan and blogger (and Pilsen native), Lubos Motl, Pilsen considers itself the most “American” city in the Czech Republic, and the adoption of the insignia was intended to be, at least in part, a tribute to the United States. According to Motl, the Pilsen insignia (pictured above) is a modified version of insignia of the United States Third Army’s 2nd Infantry Division, which liberated Pilsen and other parts of western Bohemia at the end of World War II. Unlike the rest of Czechoslovakia, which was liberated by the Russian Army, West Bohemia remained under United States control for most of 1945. After the Communist takeover in 1948, Pilsen’s ties to the United States were officially forgotten, but they have been enthusiastically revived since the Czech “Velvet Revolution” of 1988 ended Communist rule. Finally, the similarity between the HC Skoda symbol and that of the Chicago Black Hawks is probably not coincidental. Although he never played for the Chicago team, HC Svoda owner Martin Straka’s 15-year career in the National Hockey League undoubtedly made him aware of the popularity of the Black Hawks Indian head logo and the sweater on which it is embossed. Furthermore, legendary goaltender Dominic Hasek, a Czech national hero, began his NHL career with the Black Hawks. Finally, there is at least one other prominent European ice hockey team that uses a Native American logo — Frolunda HC of Gothenburg, Sweden. The Frolunda Indians play in the Swedish (Elite) Hockey League where they have three-time winners of the Le Mat trophy, which represents the championship of Swedish Hockey. Frolunda is also, year in and year out, the Swedish leader in live attendance. Their Native American logo can be seen here. Does anybody know the names of these artists? I saw them perform at the very same place in november 2015, and they were really amazing! Another example of Native American team names abroad are the Robena Braves and the Runcom Indians of the Greater Brisbane (Baseball) League in Queensland, Australia.